Delhi University Joint Admission Test, commonly known as DU JAT, is conducted once in a year for students seeking admissions to undergraduate management programmes in the institutes affiliated with Delhi University. It is a national level entrance examination. The University of Delhi is responsible to conduct this exam. Around 1162 seats across 15 participating institutes will be filled via DU JAT 2018. Aspirants of DU JAT 2018 must read this article in order to get the overview of the exam. DU JAT Exam schedule has been announced officially. Get the dates below. 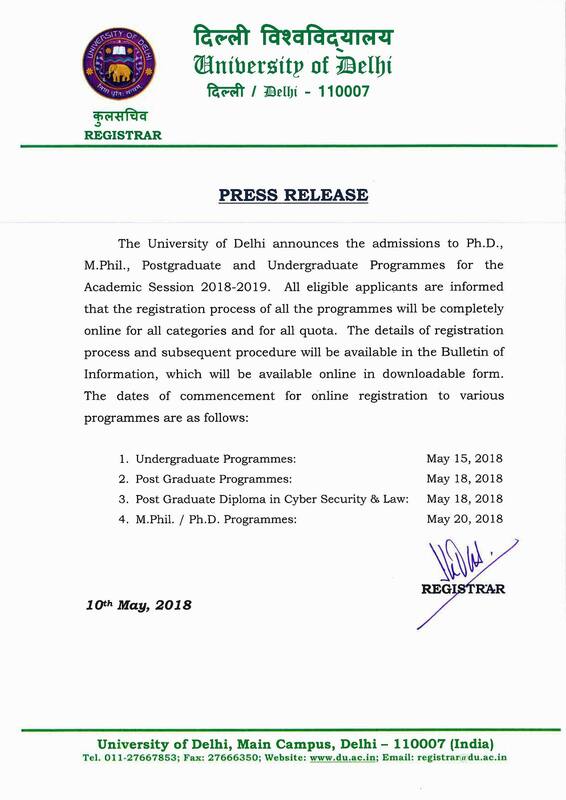 DU Registration for Undergraduate courses will begin today (15th of May 2018) at 5 PM. Click here to know the registration dates of other courses here. The official examination conducting authority has released the date of the activities related to DU JAT 2018 till now. *To know more details click here. The students who want to get enrolled in one of the above-mentioned programmes in the participating institutes affiliated to Delhi University via DU JAT 2018, they must possess the below-mentioned eligibility criteria. The aspirants are instructed to register for the exam only after knowing the required eligibility criteria. The candidate must have passed 10+2 qualifying or equivalent examination with 60% marks in four papers including English, Mathematics and other two subjects from the list of elective subjects as approved by the University of Delhi. Candidates who will attend class 12 examination in the year 2018 can also apply but they need to produce the result and mark sheet of the qualifying examination on the day of the counselling. 2. Age Limit Candidates of any age can apply for DU JAT 2018. The candidates seeking admission to undergraduate BMS, BA (Hons) in Economics and BBA Courses in the participating college affiliated to Delhi University must attend the DU JAT 2018 exam. The applicants need to register and fill up the application form in order to take the exam. The application form will be available online at the official website from 3rd week of June to 4th week of June 2018. Visit the official website and register yourself. Login by entering the login ID and password (generated during registration). Fill in the application form and upload the required documents. Submission and printout of application form. 1 mark will be deducted for incorrect answer. 1. Quantitative Ability numbers, profit and loss, fractions and decimals, ratio and proportion, graphs and pie charts. 2. General English grammar, identification of common errors, synonyms, antonyms, word formation, fill in the blanks etc. 3. Reasoning and Analytical Ability Verbal analogy, word sequence, terms and prepositions and time sequence among others. 4. General Awareness Geography, economics, history, politics and current affairs. The University of Delhi will release the DU JAT 2018 admit card after few days of the examination. Candidates can view and download the admit card online at the official website in the 1st week of July 2018. Candidates who carry their DU JAT admit card 2018 along with the identity proof will be allowed to take the exam. Admit card will contain the candidate’s name, test timing and venue, photograph and exam day instruction for the candidates. Candidates have the option of selecting their preferred choice of the center where they will have to appear for the exam. The DU JAT 2018 will be conducted in six cities including Bengaluru, Delhi, Jammu, Varanasi, Nagpur and Kolkata. The exam centre cannot be changed once the admit card is issued. Name of the examination centre will be mentioned on the admit card. The examination conducting authority will publish the DU JAT result 2018 online in the 3rd week of July 2018. The applicants have to provide the login ID and password to view the result. Candidates are advised to download and take the printout of the same for future reference. Cut off is the minimum mark that the candidates who appeared in DU JAT 2018 must obtain to become eligible for the next round of selection process. The university will release the cut-off online at the official website after declaring the result of DU JAT 2018. The candidates must check their result before going to check the cut-off. Candidate must obtain the marks equal to or more than cut off otherwise they will not be a part of counselling and admission process anymore. The cut-off mark of DU JAT 2018 will depend on the number of candidates appearing in DU JAT 2018, marks obtained by all the applicants, the number of seats available for all the programmes and the difficulty level of the question paper. After the declaration of cut-off, the authority prepares and releases the merit list. Merit List contain the name of the candidates eligible for counselling and admission round. Total three merit list is prepared and based on the list counselling is conducted. Preparation of list depends on factors same as of cut-off. Merit list contains the details like Merit List Roll Number, Name, Category, Merit Mark, JAT Mark, Final Score, Rank Overall, Rank CAT, Rank PwD, Rank CW and Rank Minority. Candidates clearing DU JAT 2018 will get admission to the participating colleges on the basis of two parameters, the first one being their score in the Joint Admission Test (JAT) and the other one is the score obtained in Class XII board exams. DU JAT 2018 score will be given 65% weightage whereas the remaining 35% will be given to what they score in class 12 qualifying examination. Candidates might be called for rounds like group discussion and personal interview. However, that depends on the participating Institute. The counselling will be conducted soon after the publication of Merit List. DU JAT counselling 2018 will take in the 4th week of July 2018. Total three rounds counselling will be held. Shortlisted candidates will be required to carry documents in the original form such as class 12 mark sheet, DU JAT rank card and admit card, character certificate of the institute last attended, category certificate (if applicable) and four passport size photographs. After the document verification during counselling process, candidates will be allotted seats in the participating colleges. Seat allotment is done after considering scores obtained by candidates in DU JAT 2018 and also based on their choice of colleges and opted courses. They have to report at the institute allotted to him/her to confirm their seats and have to pay the academic fee.